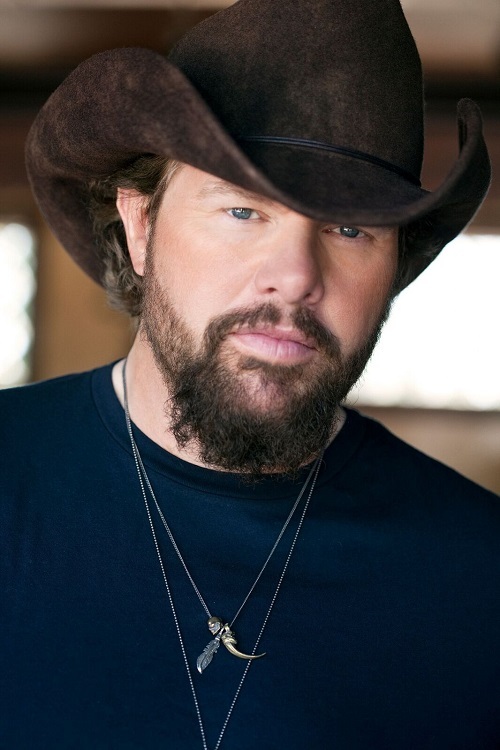 Nashville, Tenn. (September 14, 2018) - Katie Crumbo and Laurie Seabury, chairmen of the 2018 Symphony Ball fundraiser, have announced that singer and songwriter Toby Keith will be the recipient of the 2018 Harmony Award. Keith will be presented the award and perform during the 34th annual Symphony Ball on Saturday, December 8, 2018, at Schermerhorn Symphony Center. Presented annually by the Nashville Symphony and selected by a dedicated committee, the Harmony Award recognizes an individual who exemplifies the harmonious spirit of Nashville's musical community. Crumbo and Seabury revealed the news during the 2018 Symphony Ball Prelude party on Thursday, September 13, hosted at the Vanderbilt residence by Chancellor Nick Zeppos and his wife Lydia. The party, attended by approximately 80 guests, was generously underwritten by Emily and Mark Humphreys and the Pointe on 30A. "Toby Keith has the unique ability to capture the essence of life's most passionate and memorable moments through music, as evidenced by an incredible career that has produced hit music every year over the past three decades," said Crumbo and Seabury. "More than just an outstanding singer and songwriter with a legendary onstage energy, Toby has made selfless contributions to the world around him - including scores of performances for U.S. service personnel abroad and assisting the families of children with critical illnesses through the Toby Keith Foundation - that prove his impact reaches well beyond music. We look forward to celebrating Toby and all of his tremendous accomplishments at the 2018 Symphony Ball." "I'm so appreciative of this honor given to me by the Nashville Symphony," Keith said. "Thank you, it means a great deal to me." Keith is one of the modern era's most complete self-directed hit makers, and his most recent endeavors are a remarkably accurate representation of his entire career. In September 2017 he released The Bus Songs, which went on to set a Billboard Comedy Albums chart record for a country artist by holding the No. 1 spot for 11 consecutive weeks. Throughout the past year, Toby performed at Sing Me Back Home: The Music of Merle Haggard in Nashville, and he took the stage at Carnegie Hall for The Cake and the Rain: A Celebration of the Music of Jimmy Webb in New York City, where he performed Webb's classic, "MacArthur Park." The Academy of Country Music also honored Keith with their Poet's Award for songwriting in recognition of his outstanding and longstanding musical and lyrical contributions as a songwriter throughout his career, and his songs' impact on the culture of country music. Rounding out the year full of music-related accomplishments was his 15th Annual Toby Keith & Friends Golf Classic, which raised $1 million to aid sick children and their families in Oklahoma. This year, Keith honors the 25th anniversary of the release of his debut single with his aptly named tour "Should've Been a Cowboy Tour XXV presented by Ford F-Series." From the moment that song was released and shot up the charts to become his first No. 1, the engine driving everything has been the music. He writes it. He arranges and produces it. And he releases it on his own record label, Show Dog Nashville. At the core is his songwriting, as recognized in his 2015 induction into the Songwriters Hall of Fame in New York City. That year Robert Hunter and Jerry Garcia of the Grateful Dead, Willie Dixon and other songwriters from all genres of music were also included in his induction class. The Nashville Songwriters Association International named him Songwriter/Artist of the Decade, and he is a three-time BMI Country Songwriter/Artist of the Year. His songs have received more than 91 million BMI performances on commercial radio stations worldwide. Keith's albums have sold more than 40 million copies. His tours have drawn more than a million fans each year for more than a decade straight, with recent expansion into Europe and Australia. The awards are too numerous to count and include Artist of the Decade nods from Billboard and the American Country Awards, as well as the ACM's Career Achievement honor and twice their Entertainer of the Year award in back-to-back years. Keith's most rewarding experiences, however, have come from giving back locally, nationally and abroad. His golf classics fund the Toby Keith Foundation and OK Kids Korral, a cost-free home for families of children dealing with critical illnesses. His 11 USO Tours to date have enhanced the lives of nearly 256,000 troops and military families in 18 countries with more than 285 events, and have been recognized with the Spirit of the USO Award (2014). And when a tornado ravaged his hometown, Toby Keith was the face of the community and helped shoulder the cleanup with the 2013 OK Twister Relief Concert. The Symphony Ball is Nashville's premier winter social event and one of the Nashville Symphony's two annual fundraisers. Since its inception in 1985, the Ball has raised millions for the Symphony, sustaining the organization's mission of achieving excellence in musical performance and educational programs, while engaging the community, enriching audiences and shaping cultural life. The GRAMMY® Award-winning Nashville Symphony has earned an international reputation for its innovative programming and its commitment to performing, recording and commissioning works by America's leading composers. The Nashville Symphony has released 29 recordings on Naxos, which have received 24 GRAMMY® nominations and 13 GRAMMY® Awards, making it one of the most active recording orchestras in the country. The orchestra has also released recordings on Decca, Deutsche Grammophon and New West Records, among other labels. With more than 140 performances annually, the orchestra offers a broad range of classical, pops and jazz, and children's concerts, while its extensive education and community engagement programs reach 60,000 children and adults each year.